The dendritic cell (DC) is presenting an antigen to a T cell but the T cell doesn’t recognize it. This is making the DC kind of sad. In this case the DC is presenting the antigen on an MHC-I molecule and it is showing to a CD8 T cells. 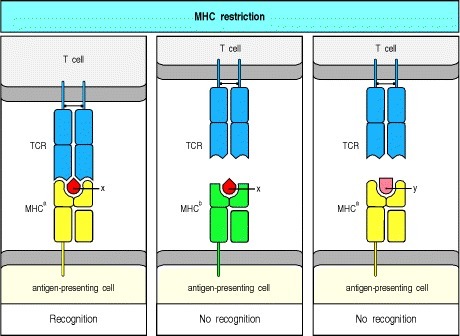 However, the T cell will recognize and respond to the antigen, only when if it is a specific antigen and it is bound to a particular MHC molecule. This process is called MHC restriction. The antigen-specific T-cell receptor (TCR) recognizes a complex of antigenic peptide and MHC. One consequence of this is that a T cell specific for peptide x and a particular MHC allele, MHCa (left panel), will not recognize the complex of peptide x with a different MHC allele, MHCb (center panel), or the complex of peptide y with MHCa (right panel). The co-recognition of peptide and MHC molecule is known as MHC restriction because the MHC molecule is said to restrict the ability of the T cell to recognize antigen. This restriction may either result from direct contact between MHC molecule and T-cell receptor or be an indirect effect of MHC polymorphism on the peptides that bind or on their bound conformation. Epithelial cells form a layer that line several organs of the body providing a barrier to the outside world. In other words, the epithelial cells help to protect or enclose the organs. Epithelial cells are held together by tight junctions, which form a virtually impermeable barrier to prevent leakage of fluid (including molecules and ions) across the cell layer, so materials must actually enter the cells in order to pass through the tissue. Cell-Cell Adhesion and Communication on Molecular Cell Biology. 4th edition. 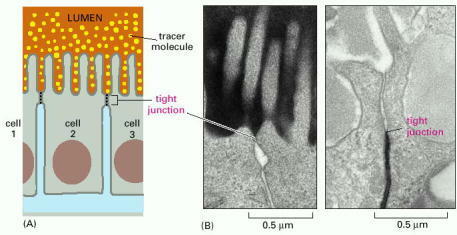 Cell Junctions on Molecular Biology of the Cell. 4th edition. Flow cytometry is a very popular and commonly used technology to analyze the characteristics of cells or particles. For more information on this technique see the pdf on Introduction To Flow Cytometry by Abcam. These feisty granulocytes will defeat any bacteria, fungus or parasite that wants to mess with them. Check out the full blog post on granulocytes to lear more about each one of these cells. A big challenge of the immune system in the intestine is being able to distinguish between harmful pathogens and at the same time be tolerant towards harmless antigens derived from food and commensal bacteria (good bacteria). Mechanisms to maintain tolerance are therefore necessary to avoid unwanted immune responses that may lead to inflammatory bowel diseases (IBD) like Crohn’s disease or ulcerative colitis. The dendritic cells (DCs) found in the intestine are crucial to maintaining this equilibrium. DCs are constantly sampling antigens, such as food antigens. One way these cells sample antigens directly from the intestinal lumen is by inserting their dendritic processes between the epithelial cells layer . The T cells found in the epithelium located between intestinal epithelial cells are called intraepithelial lymphocytes (IELs) and are thought to contribute to intestinal homeostasis by regulating the turnover of IECs and secreting hormones for epithelial repair . Below are some resources in case you are interested in learning more about the immune system in the intestine. A virus is a small infectious agent that needs other cells to replicate. The virus gets its genetic material inside the cell and the cell then uses its machinery to read the genetic code and create virus proteins that will form new viral particles. The cartoon is showing a cell that has been infected and is now producing virus that are being released. Neutrophil are the most abundant type of white blood cells and are part of the granulocyte family or the polymorphonuclear cells family. They get the name ‘polymorphonuclear cells’ because of the varying shapes of the nucleus, which is usually lobed into three segments. Neutrophils are the first cells to get to the site of infection, they are professional phagocytes and ferocious eaters that rapidly engulf invaders. Here is a video you can watch of a neutrophil chasing a bacteria. The lab of Dr. Paul Kubes from Calgary University does research on neutrophils. He and his team have published some pretty neat videos of neutrophils moving around tissue. The technique he uses to generate these videos is called intravital microscopy. In the video below the neutrophils are seen in green migrating through blood vessels (blue) towards an area of tissue damage in the liver (red). For those who want a more in-depth overview of neutrophils and the latest and most up to date findings here are some resources. Leukocyte extravasation is the movement of leukocytes out of the circulatory system and towards the site of tissue damage or infection. This process is regulated by a concerted action between endothelial cells and leukocytes, whereby endothelial cells activate leukocytes and direct them to extravasation sites, and leukocytes in turn instruct endothelial cells to open a path for transmigration. Below is a figure from the Nature Immunolog review, that I mentioned above, with an illustration of the steps involved in leukocyte extravasation. Dendritic cells (DCs) are named after their branched projections called dendrites. These cells are the sentinels of the immune system and are always testing their surroundings in case they see any danger. DCs process antigens they pick up from their surrounding and present these to T cells.